As we commemorate the 100th anniversary of the start of World War I, an exhibition catalogue in the Library’s collections takes us back to 1968 and the 50th anniversary of Armistice Day: the official end of the War on 11 November 1918. 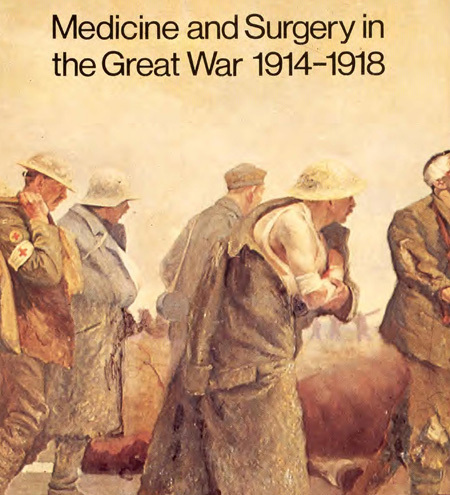 Catalogue cover for the exhibition: Medicine and Surgery in the Great War 1914-1918: an exhibition to commemorate the 50th anniversary of the Armistice, 11 November 1918. Wellcome Institute, 1968. Even by the global standards of today, the huge numbers involved in World War I astound. Around 65 million people were directly engaged in the War, on all sides, of these almost 8 million were killed and over 19 million wounded – nearly twice as many as in World War II. An introductory essay in the exhibition catalogue, written by the Institute Director F.N.L. Poynter, gives a nice summary of these activities, and the medical logistics bring home the sheer scale of operations. From around 20,000 medical personnel in the army at the start of the War, the numbers rose to 13,000 officers and 154,000 other ranks by November 1918. A major concern in the preservation of health was controlling the spread of infection amongst the troops. At the Western Front, much of the natural vegetation and drainage was destroyed by heavy artillery bombardment, so the soldiers found themselves living in a “vast sea of malodorous mud” where dangerous micro-organisms flourished. The provision of clean water and effective sanitation was therefore a priority. 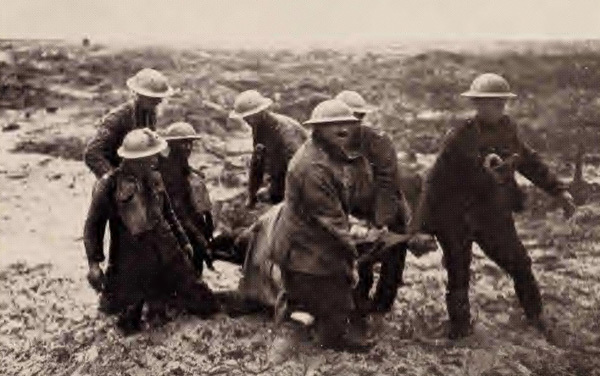 Stretcher bearers struggling through the mud of Flanders on the Western Front. Photograph in the exhibition catalogue. One intriguing item listed in the catalogue for the control of infection is the Somerville Asiatic body cord, developed from an “Indian folk-medicine device”. 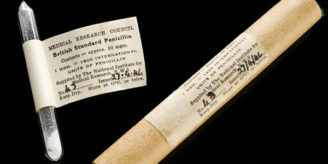 It consisted of a wool chord impregnated with mercury and bees-wax that was worn around the waist to kill lice, which could spread typhoid and other diseases. Injuries from explosive missiles and shrapnel were complicated by contamination from mud and soiled clothing, which were driven deep into the wound. Traditional forms of anti-septic proved ineffectual and alternatives were sought. In addition to developing new techniques such as continuous irrigation of the wound, there was a return to the older of techniques of amputation and debridement (cutting away infected tissue) in order to save lives under desperate conditions. 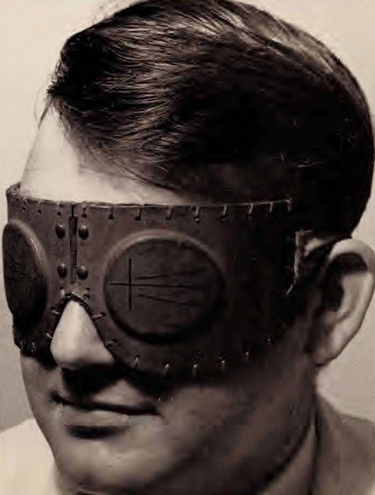 Anti-flash and anti-splinter goggles. Photograph in the exhibition catalogue. The exhibition catalogue is interesting, not just for its content about medicine during the War, but also for its insights into collection and display priorities at the Wellcome Institute 50 years ago. 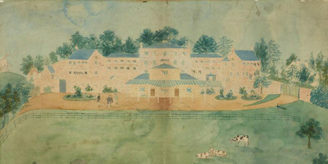 The Wellcome Institute’s audience, reflecting its research activities, was primarily academic, and the catalogue provides extensive references to the original documents and academic papers that were used for the exhibition. These are also an excellent resource for anyone researching World War I today!